The Cook County Land Bank Authority (CCLBA) will soon begin a community-led redevelopment process of the Washington Park National Bank Building, executive director Rob Rose announced at a Woodlawn Chamber of Commerce meeting this past Friday evening. Now, the empty building has moved a small step closer toward a resurrection, though it remains to be seen how faithful that will be to preservationists’ wishes. The CCLBA—which was created in 2013 as part of the Cook County Government—obtains, refurbishes, and sells off vacant, abandoned, or tax-delinquent properties across the city. The redevelopment process will consist of three separate meetings in early 2018, each of them open to the entire Woodlawn community. The input from those meetings will then structure the subsequent Request for Proposals (RFP) from developers, said Rose. Basically, this means that any developer who submits a plan for the bank building in response to the RFP will, in all likelihood, have to abide by planning guidelines agreed upon by Woodlawn residents. The RFP itself will be released by the city in April and awarded at some point during the summer, according to Rose. The planning process that the CCLBA is using originates from the Metropolitan Planning Council (MPC)’s Corridor Development Initiative (CDI). The MPC, which will operate as a partner on the project, describes the CDI on its website as a process that “helps residents understand issues such as density, affordable housing and the true cost of development, while creating a set of priorities to guide community leaders as they plan for future development in their neighborhoods.” It’s not the first time the agency has facilitated a CDI in the area: starting in 2008, the agency used the process during the early stages of planning the Harper Court development in Hyde Park. “In Woodlawn, we want to look at what’s been done, what’s been said. We recognize that there’s a lot of work that’s been done here,” said Kendra Freeman, a manager at the MPC. Before it was taken over by the CCLBA, the Washington Park Bank Building was owned by the Metropolitan Apostolic Community Church and the Woodlawn Community Development Corporation, according to public records. Rose said that the CCLBA acquired the property in a tax sale, an auction in which bidders can buy stakes in properties that have fallen behind on their taxes. According to records from the Cook County Clerk’s Office, the property has accumulated more than $500,000 in unpaid taxes since 1996. In recent years, however, Finney has come under scrutiny for his practices as a landlord. In 2010, a group of Finney’s tenants protested living conditions at his buildings at City Hall. In 2011, he was briefly added to the city’s list of scofflaw landlords (landlords barred from doing business with the city because of code violations on their properties). But while Finney, or an organization he’s affiliated with, has owned the bank building for decades, the structure’s history stretches further back, to the beginning of the twentieth century. As the Weekly reported last year, it was erected in 1924 as part of a localized building boom that saw five other structures around 63rd and Cottage Grove go up around the same time. The architect behind it, Albert A. Schwartz, appears to have had an affinity for South Side bank buildings—he also designed the South Side Trust and Savings Bank in Bronzeville. 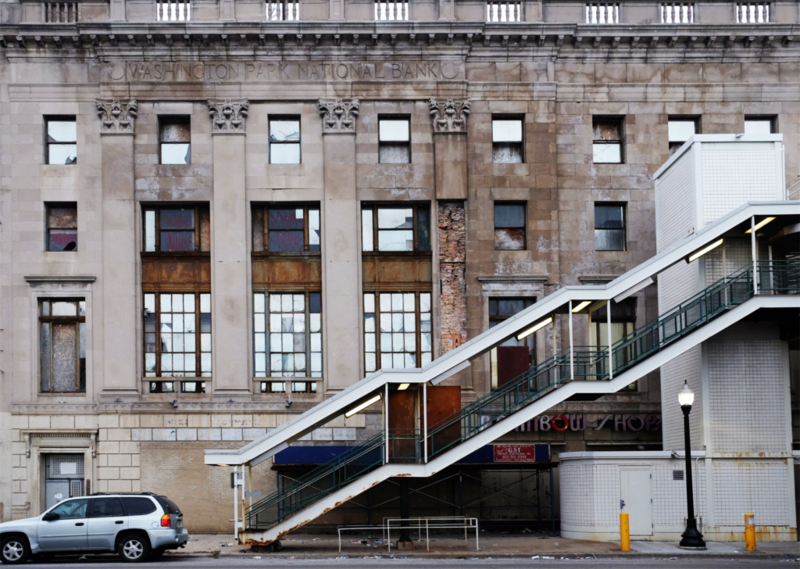 Though the Washington Park National Bank was never particularly stable, the building itself, with a fondly remembered Walgreens on the ground floor, recalls Woodlawn’s more prosperous past. But the building has not been declared a federal, state, or municipal landmark; it’s not listed on the National Register of Historic Places or the Chicago Landmarks list. That means that it’s not subject to certain protective regulations governing its redevelopment, and that a demolition, or an otherwise radical restructuring of the building, remains an option. Rose also noted that the city has begun a feasibility study of the building in order to determine exactly what limitations there will have to be on any new development, and that results from that study will be shared at the first community meeting. Rose announced at the meeting that the CCLBA also owns a significant number of other properties in West Woodlawn, each of which it intends to sell off gradually to individual developers. Online records show that in the part of West Woodlawn bounded by 63rd and 67th Street, and King Drive and Cottage Grove, the organization owns seventy-nine parcels, all but one of them currently vacant land. Although this sale process will presumably take place less publicly, the cumulative fate of these parcels, and the organization’s other properties in the neighborhood, will end up having an far greater impact on Woodlawn’s future than the redevelopment of any single building, however prominent. The Metropolitan Planning Council plans to release more information, including meeting times and locations, in the following weeks. Visit metroplanning.org/woodlawn for more information. I HAVE ATTENDED A MPC MEETING AND INTEND ON ATTENDING THE UPCOMING 2018 MEETING. I missed the last meeting I’m looking forward to being at the next meeting.